The Bold and Beautiful (BB) spoilers for Tuesday, December 11, 2018 tease that we will have a day filled with one supporting another, another becomes anxious, and let’s not forget plenty of drama. You will not want to miss a moment of the action! Taylor Hayes (Hunter Tylo) vents to Dr. Reese Buckingham (Wayne Brady) about Brooke Logan Forrester (Katherine Kelly Lang), who shows his support by giving her a kiss. Taylor is getting overwhelmed by Brooke knowing her secret. She knows that she and Brooke have a very rocky past on Bold and Beautiful and feels Brooke will want to get back at her even though she gave her word not to turn her into the authorities. Taylor will not give Dr. Reese full details but will fill him in on some of their past. Dr. Reese Buckingham is very interested in Taylor Hayes and wants to show her that he is there for her. He will be a sounding board to her and will even try to help her to the best of ability. Taylor will be thrilled to know that someone actually gives a darn about her and what she has been going through. She will be grateful to him for his support. Dr. Reese will try to show his support even more by giving her a kiss. How do you think Taylor will react to that? Would you B&B fans like to see these two as a couple? Other “Bold and Beautiful” spoilers suggest that Steffy Forrester Spencer (Jacqueline Wood) becomes anxious that everyone in her life is against her mother. As we all know Liam Spencer (Scott Clifton) and Hope Logan Spencer (Annika Noelle) share a great deal of concern over Taylor Hayes being stable. Brooke Logan Forrester is not buying that she is. 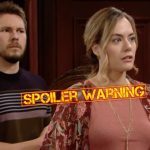 Bold and The Beautiful Weekly Spoilers December 10 to 14: Liam and Steffy Fight – Taylor and Reese Connect & More! Ridge Forrester has been the only one backing Steffy so far with her mother. Do you think they all have valid reasons for being concerned? Do you think Taylor could snap again?